Gardman R971 Blacksmith Jardinière with Coco Liner, 16" Wide x 28.75" High. Strength and decorative design combine in this sturdy jardinière planter. The bold, timeless design features an eye-catching base and pedestal. All vertical rods on the basket section contain an attractive barley twist design. 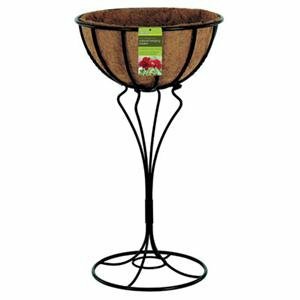 Base, pedestal support, and planter are easily assembled or disassembled for storage with no tools push rod design. Heavy-duty solid rod and square steel construction with welded joints to provide years of use. Powder-coated with a black rust resistant finish. The planter depth provides excellent soil volume and moisture retention. Attached pre-formed coco liner included for easy planting. Coco fiber provides superior drainage and aeration promoting fuller and healthier plant development. Planting tip: adding a plastic liner will help hold moisture in so you can water less often. Use something as simple as a grocery sack. Poke holes in the plastic liner to allow planter to drain adequately. Dimensions: 16" Long x 16" Wide x 28.75" High. **Replacement coco liner (sold separately) is Gardman model R585.Gardman "Bring your garden to life"